Lewis Hamilton and Nico Rosberg will remain free to race in their battle for 2014 Formula 1 title glory, following key talks at the Mercedes factory on Friday. 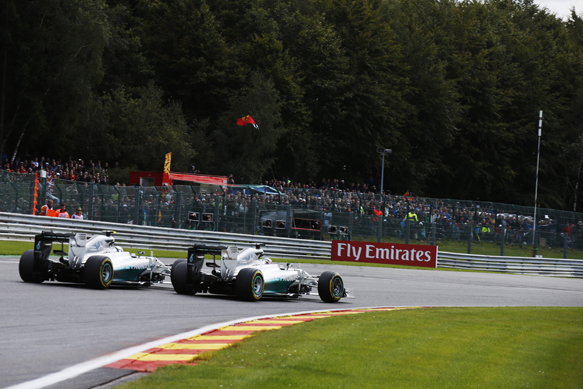 The duo were summoned to a meeting with Mercedes chiefs Toto Wolff and Paddy Lowe to discuss the fallout of their collision at the Belgian Grand Prix last weekend. In a statement issued by the team afterwards, Mercedes made it clear that it would not be imposing team orders to avoid a repeat scenario. Instead, the team's policy of allowing Rosberg and Hamilton to battle it out would remain, although it stressed that further collisions would not be tolerated. Furthermore, it emerged that Rosberg accepted blame for the crash with Hamilton, and apologised. The team has also taken unspecified disciplinary action against the German. The full statement said: "Toto Wolff, Paddy Lowe, Nico Rosberg and Lewis Hamilton met today in the boardroom of Mercedes AMG Petronas headquarters in Brackley to discuss the events of the Belgian Grand Prix. "During this meeting, Nico acknowledged his responsibility for the contact that occurred on lap two of the Belgian Grand Prix and apologised for this error of judgement. "They remain free to race for the 2014 FIA Formula 1 world championship." Rosberg is 29 points clear of Hamilton in the drivers' championship standings, ahead of next week's Italian Grand Prix.